A lymphocyte is a type of white blood cell in the vertebrate immune system. NK cells are a part of the innate immune system and play a major role in defending the host from both tumors and virally infected cells. T cells are involved in cell-mediated immunity whereas B cells are primarily responsible for humoral immunity (relating to antibodies ). Helper T-cells coordinate immune responses, while cytotoxic T-cells lyse (break down) pathogens associated with T cell’s specific antigen. Memory B cells are formed at the end of an adaptive immune response and will produce antibodies more quickly when the antigen is detected again, which is effective at preventing recurrent infections from the same pathogen. Sometimes the body will present antigens that aren’t harmful (allergy) or antigens from otherwise normally functioning body parts (autoimmunity). The latter can cause severe antibody and T-cell induced immune responses and diseases. humoral immunity: Immunity to infection due to antibodies that circulate in the blood and lymph and are produced by B cells. antigen: Any molecule that activates an immune response from a host organism, such as a toxin produced by bacteria or a molecule expressed on the cell wall of a virus -infected cell. lymphocyte: A type of white blood cell that includes T cells, B cells, and NK cells. A lymphocyte is a type of white blood cell in the immune system. Lymphocytes develop from lymphoblasts (differentiated blood stem cells) within lymphoid tissue in organs such as the thymus. Lymphocytes are vital for normal immune system function. The three major types of lymphocyte are T cells, B cells, and natural killer cells. 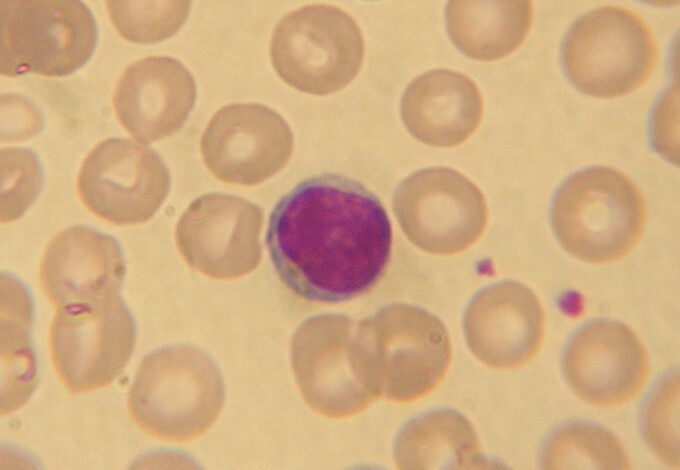 Lymphocyte: A stained lymphocyte surrounded by red blood cells viewed using a light microscope. 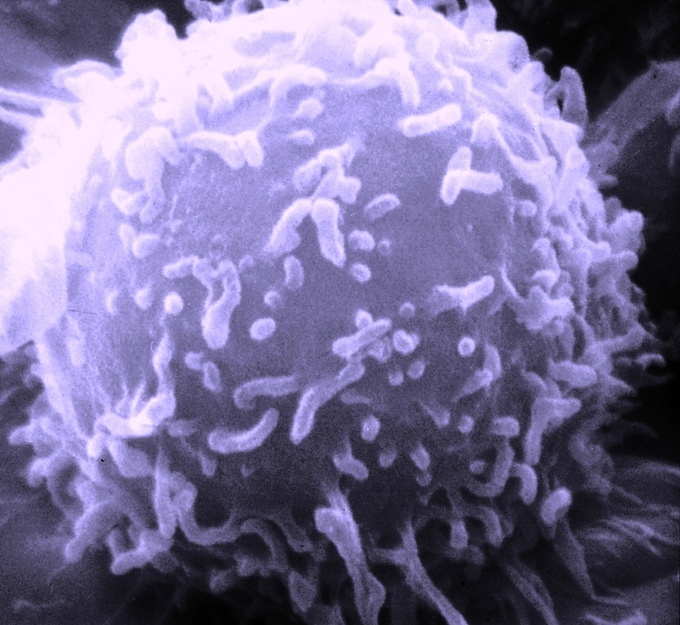 Natural killer (NK) cells are part of the innate immune system and play a major role in defending the host from both tumors and virus-infected cells. NK cells contain receptors for a molecule called MHC (major histocompatibility complex) class I, which allows the NK cell to distinguish between infected cells and tumors from normal and uninfected cells. Normal cells express MHC class I on their cell membranes, while infected or cancerous cells do not express or express reduced amounts of the molecule. Therefore, the molecule acts as an inhibitor of NK cell activity, and NK cells activate and destroy cells on which MHC class I is not detected. Activated NK cells release cytotoxic (cell-killing) granules that contain perforin and granzyme, which can lyse (break down) cell membranes and induce apoptosis to kill infected or abnormal cells. Cancer cells express much less MHC class I than normal cells, so NK cells are effective at destroying them before they develop into full tumors. If cancer cells evade NK cell detection for long enough, however, they can grow into tumors that are more resistant to NK cell activity. T and B lymphocytes are the main forces of adaptive immunity, which includes cell-mediated and humoral immunity. T cells are involved in cell-mediated immunity whereas B cells are primarily responsible for humoral immunity. T cells and B cells irecognize specific “non-self” antigens during a process known as antigen presentation with MHC class II (usually done by dendritic cells). Once they have received an antigen, the cells become specifically tailored to eliminate and inhibit the pathogens or pathogen-infected cells that express that antigen. Sometimes these lymphocytes react to antigens that aren’t harmful (allergy) or will attack antigens expressed from the host’s own body (autoimmunity). There are two types of T cells involved in adaptive, cell-mediated immunity. Helper T cells (CD4s) facilitate the organization of immune responses. They present antigens to B cells, produce cytokines that guide cytotoxic T cells, and activate macrophages. Cytotoxic T cells (CD8s) destroy pathogens associated with an antigen. Similar to NK cells, they bind to MHC class I and release granzymes, but will only bind to cells that express their specific antigen. Cytoxic T cells cause much of the damage associated with cell-mediated hypersensitivity, autoimmune disorders, and organ transplant rejection. B cells are part of the humoral component of adaptive immunity. They respond to pathogens by producing large quantities of antigen-specific antibodies which neutralize foreign objects like bacteria and viruses, and opsonize (mark) them to be more easily recognized by other immune cells. Following activation, B cells and T cells leave a lasting legacy of the antigens they have encountered in the form of memory cells. Memory B cells are important for quickly producing antibodies should an antigen be recognized again, which can prevent recurrent infections from the same type of pathogen. This explains why vaccines are so effective, though viruses and bacteria with high mutation rates will express different antigens and thus avoid recognition by memory cells. SEM Lymphocyte: A scanning electron microscope (SEM) image of a single human lymphocyte. All lymphocytes originate from a common lymphoid progenitor cell known as a lymphoblast, before differentiating into their distinct lymphocyte types. The formation of lymphocytes is known as lymphopoiesis. B cells mature into B lymphocytes in the bone marrow, while T cells migrate to and mature in thymus. Following maturation, the lymphocytes enter the circulation and peripheral lymphoid organs, where they survey for invading pathogens and cancer cells. The lymphocytes involved in adaptive immunity (B and T cells) differentiate further after exposure to an antigen, which occurs in the lymph nodes during antigen presentation from the dendritic cells. The fully differentiated B and T cells are specific to the presented antigen and work to defend the body against pathogens associated with that antigen.